iOS 9.3: What features are in the new iPhone and iPad update? 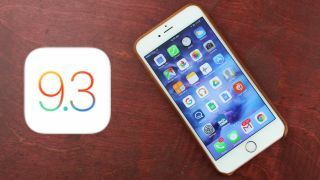 Update: iOS 9.3 is Apple's mid-cycle software revision with the latest version, iOS 9.3.3, destined to be the last before the iOS 10, barring an iOS 9.4 update. Here are all of the changes. iOS 9.3 launched in March as the biggest incremental iPhone and iPad update in several years, as Apple has new software features that go as far as changing your sleeping habits. That's right, it has the long-sought-after iPhone Night Shift feature, which controls the blue light levels emitted from your screen, and it's finally out of beta so that everyone can download it today, under the current version for June, iOS 9.3.3. Plenty of other useful features are here, too: multi-user support for students, Apple Notes locked behind a password (or Touch ID) and tweaked News, Health and Apple CarPlay apps. In the US, Verizon gains Wi-Fi calling - finally. All of these iOS 9.3 feature are available on devices that run iOS 9 and the update launching along the new iPad Pro 9.7 tablet and iPhone SE phone on March 31. It's not without iOS 9.3 problems, like authentication issues for iPad 2, and iOS 9.3.2 mishaps on the newest iPad. But there were speedy fixes and now everyone can download the newest features. I've read dozens of news stories that tell me I shouldn't go to bed staring at my iPhone 6S Plus, my iPad Air 2 or my new MacBook, but do I follow those wise instructions? No. Night Shift is the iOS 9.3 solution I've been waiting for, because it won't require me to change my nighttime reading and working habits. It automatically tints my screen to warmer colors. "Many studies have shown that exposure to bright blue light in the evening can affect your circadian rhythms and make it harder to fall asleep," according to Apple. What's neat is that iOS 9.3 uses the clock and geolocation to determine the sunset, and the screen becomes progressively more orange-tinted throughout the night, exactly like f.lux on Macs and Reader's Edition on Amazon Kindle HD 8. The completely optional Night Shift mode is found in Settings > Display and Brightness > Blue Light Reduction, with a slider bar to control how orange or blue it looks, and to adjust the schedule. Apple's swipe-up-from-the-bottom Control Center overlay menu adds Night Shift to the bottom row of quick settings. It's right in the middle, flanked by flashlight and timer on the left and calculator and camera on the right. That's how important this feature is for the new update. It's all designed to allow your eyes to relax so that falling asleep is easier, and when it's time to wake up, the screen color shifts back to normal. It's the best feature found within iOS 9.3. There's no sign of an iOS 9.4 update yet, and there may never be a system update to the nearest tenth decimal place. That's because iOS 10 launched at Apple's WWDC 2016 on June 13. Instead, what we have is iOS 9.3.3 beta for some devices - some because the iPad Pro 9.7 update was initially pulled when iOS 9.3.2 began bricking devices with "error 56." It's a familiar story: iOS 9.3.1 brought in a new fix for a bug that was making Safari crashed for some users. When iOS 9.3 first launched, certain apps installed could crashed Safari when you tried to use links within the web browser. There were enough cases of this that Apple quickly remedied the problem. iOS 9.3.3, now out of beta form, involves a bunch of background tweaks instead of front-facing features. iOS 9.3.2 did have one notable change in that Night Shift and Low-Power Mode worked at the same time. Originally, with iOS 9.3, one disables the other. Onto the rest of the iOS 9.3 features. Buried in the iOS 9.3 release notes is the first sign of multi-user support, only it's strictly for classroom iPads right now. It's one of Tim Cook's favorite Apple products. Apple calls this new app suite 'iOS in Education', and the highlight is the fact that it enables students to log into any iPad in any classroom and pick up where they left off. This makes a lot of sense for a school's shared iPad experience, and it comes with Photo IDs to denote profiles and simple passwords for younger students. iOS in Education also includes three other apps meant for teachers and school officials: a new Classroom app for teach-guided lessons that ensures the students follow along, and Apple School Manager and Managed Apple IDs for consolidated admin portals. Even if you're not going to school, the simple fact that Apple has built one form of a multi-user login experience should give you high hope for the future, though it wasn't part of the iOS 10 announcement. Before the new iOS 9.3 arrived, keeping confidential information in Apple Notes could be a little risky. Anyone could nab your unlocked iPhone and scan the secrets you jotted down. Thankfully, the power of Touch ID and passcodes are now a part of Apple Notes. Far too many people (read: parents) keep all of their financial data, medical information and passwords in this not-so-secret app. iOS 9.3 allows your vulnerable folks to protect certain notes under lock and fingerprint for extra security. It also lets you sort everything by date created, date modified and alphabetically now.